One of America's major writers, Edgar Allan Poe was far ahead of his time in his vision of a special area of human experience—the "inner world" of dreams and the imagination. He wrote fiction, poetry, and criticism and also worked as a magazine editor. Edgar Allan Poe was born in Boston, Massachusetts, on January 19, 1809, the son of David Poe Jr. and Elizabeth Arnold Poe, both professional actors. By the time he was three, Edgar, his older brother, and his younger sister were orphans; their father deserted the family, and then their mother died. The children were each sent to different families to live. 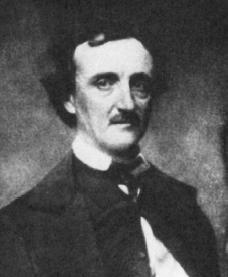 Edgar went to the Richmond, Virginia, home of John and Frances Allan, whose name Poe was to take later as his own middle name. The Allans were wealthy, and though they never adopted Poe, they treated him like a son, made sure he was educated in private academies, and took him to England for a five-year stay. Mrs. Allan, at least, showed considerable affection toward him. As Edgar entered his teenage years, however, bad feelings developed between him and John Allan. Allan disapproved of Edgar's ambition to become a writer, thought he was ungrateful, and seems to have decided to cut Poe out of his will. When, in 1826, Poe entered the newly opened University of Virginia, he had so little money that he turned to gambling in an attempt to make money. In eight months he lost two thousand dollars. Allan's refusal to help him led to a final break between the two, and in March 1827 Poe went out on his own. Poe then signed up for a five-year term in the U.S. Army. In 1827 his Tamerlane and Other Poems was published at his own expense, but the book failed to attract notice. By January 1829, serving under the name of Edgar A. Perry, Poe rose to the rank of sergeant major. He did not want to serve out the full five years, however, and he arranged to be discharged from the army on the condition that he would seek an appointment at West Point Academy. He thought such a move might please John Allan. That same year Al Araaf, Tamerlane and Minor Poems was published in Baltimore, Maryland, and it received a highly favorable notice from the novelist and critic John Neal. Poe visited Allan in Richmond, but he left in May 1830 after he and Allan had another violent quarrel. The West Point appointment came through the next month, but, since Poe no longer had any use for it, he did not last long. Lacking Allan's permission to resign, Poe sought and received a dismissal for "gross neglect of duty" and "disobedience of orders." Poe realized that he would never receive financial help from Allan. lawyer and writer, got him a job on the Southern Literary Messenger. In 1836 Poe married his cousin Virginia—now thirteen years old—and moved to Richmond with her and her mother. Although excessive drinking caused him to lose his job in 1837, he had written eighty-three reviews, six poems, four essays, and three short stories for the journal. He had also greatly increased its sales. Losing this job was extremely distressing to him, and his state of mind from then on, as one biographer put it, "was never very far from panic." The panic increased after 1837. Poe moved with Virginia and her mother to New York City, where he managed to publish The Narrative of Arthur Gordon Pym (1838), his only long work of fiction. The family then moved to Philadelphia, Pennsylvania, where Poe served as coeditor of Burton's Gentleman's Magazine. In two years he boosted its circulation from five thousand to twenty thousand and contributed some of his best fiction to its pages, including "The Fall of the House of Usher." In 1840 he published Tales of the Grotesque and Arabesque. But there was trouble at Burton's, and in 1841 Poe left to work as the editor of Graham's Magazine. It was becoming clear that two years was about as long as Poe could hold a job, and though he contributed quality fiction and criticism to the magazine, his drinking, his feuding with other writers, and his inability to get along with people caused him to leave after 1842. "The Murders in the Rue Morgue" and "The Man That Was Used Up" emerged in 1843, and a Philadelphia newspaper offered a one-hundred-dollar prize for his story "The Gold Bug," but Poe's problems were increasing. His wife, who had been a vital source of comfort and support to him, began showing signs of the consumption (or tuberculosis, an infection of the lungs) that would eventually kill her. When his troubles became too great, Poe tried to relieve them by drinking, which made him ill. Things seemed to improve slightly in 1844; the publication of the poem "The Raven" brought him some fame, and this success was followed in 1845 by the publication of two volumes, The Raven and Other Poems and Tales. But his wife's health continued to worsen, and he was still not earning enough money to support her and Clemm. Poe's next job was with Godey's Lady's Book, but he was unable to keep steady employment, and things got so bad that he and his family almost starved in the winter of 1846. Then, on January 30, 1847, Virginia Poe died. Somehow Poe continued to produce work of very high caliber. In 1848 he published the ambitious Eureka, and he returned to Richmond in 1849 to court a now-widowed friend of his youth, Mrs. Shelton. They were to be married, and Poe left for New York City at the end of September to bring Clemm back for the wedding. On the way he stopped off in Baltimore, Maryland. No one knows exactly what happened, but he was found unconscious on October 3, 1849, near a saloon that had been used as a polling place. He died in a hospital four days later. It is not hard to see the connection between the nightmare of Poe's life and his work. His fictional work resembles the dreams of a troubled individual who keeps coming back, night after night, to the same pattern of dream. At times he traces out the pattern lightly, at other times in a "thoughtful" mood, but often the tone is terror. He finds himself descending, into a cellar, a wine vault, or a whirlpool, always falling. The women he meets either change form into someone else or are whisked away completely. And at last he drops off, into a pit or a river or a walled-up tomb. Bittner, William R. Poe: A Biography. Boston: Little, Brown, 1962. Meyers, Jeffrey. Edgar Allan Poe: His Life and Legacy. New York: Charles Scribner's Sons, 1992. Quinn, Arthur H. Edgar Allan Poe: A Critical Biography. New York: Appleton-Century, 1941. Reprint, Baltimore: Johns Hopkins University Press, 1998. Walsh, John Evangelist. Midnight Dreary: The Mysterious Death of Edgar Allan Poe. New Brunswick, NJ: Rutgers University Press, 1998.
this is wonderful! :) hahahaha! I used this site every time i write a research paper it provided every bit of information i needed and i got done with my papers. I absoulutely loved this site senor i thought it was dliciously good senor thank you senors for this site. I have always been told by my family that we were related to Poe. I have not been able to prove this. My great grandmother was Martha Virginia Poe from Elkins, W.V. Her first husband was Iddo Buker. She had two children - David and Ella Mae. Can anyone help me? It is very nice biography and for those who are asking, Edgar's death was a mystery. It was said that he died because he drank too much and maybe he might have died because of heart disease or maybe even suicide, but no one really knows.